There’s nothing I love more than sipping an icy drink on a hot summer day. A fresh fruit slush is a perfect poolside drink (or while you’re hiding from the kids and binge watching Grey’s Anatomy). Just a few simple ingredients (really!) make for a yummy, refreshing beverage that you’ll be wanting to sip all summer long. Also great: this fruit slush made with melons and berries is pretty good for you! 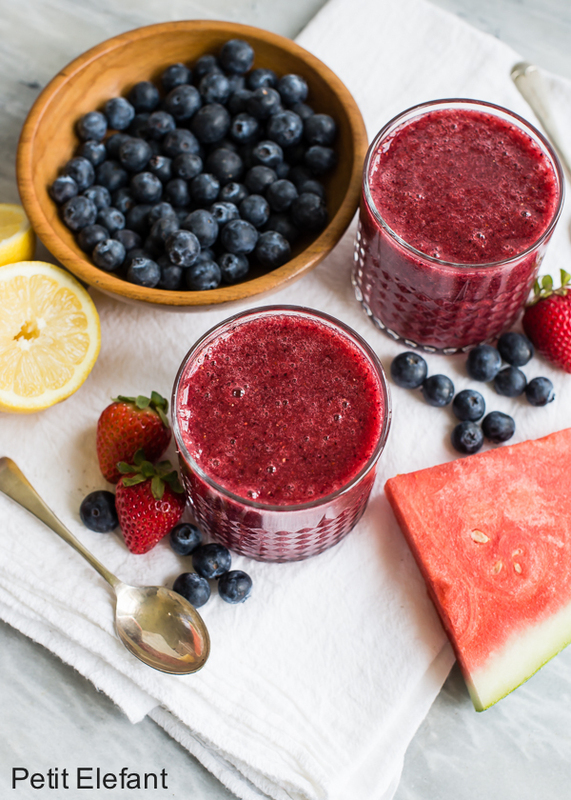 This fruit slush calls for watermelon and berries which are fantastic together, and both are plentiful during the summer months. You can mix it up and use any variety of melon and berry you prefer. Maybe honeydew and blackberry or cantaloupe and blueberry, or any combo really. Hopefully the fruit is ripe and sweet on its own, but if not, you can add a little sugar or honey to sweeten it up. For an extra refreshing drink, we like to fill our glasses with 3/4 fruit slush and 1/4 sparkling water. It’s a little bit like homemade soda, only totally fresh and healthy. Win win. 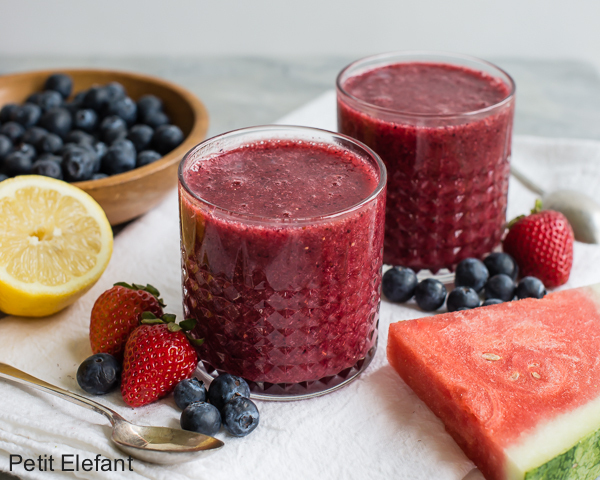 These melon berry slushes are also great for a crowd, say a BBQ or even a baby shower. Make up several batches and freeze. Pull them out right before the party, let them thaw a bit, and transfer to pitchers or individual glasses. It’s an easy make-ahead option and a crowd pleaser. 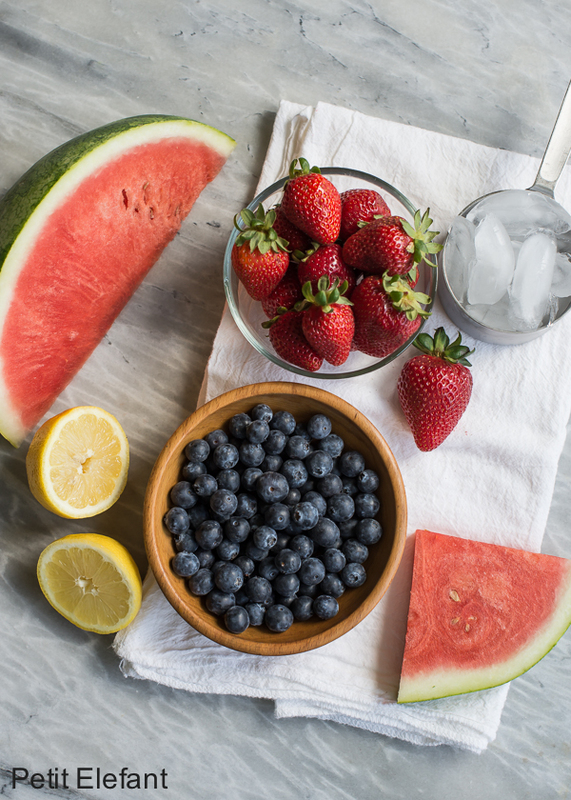 Place melon, berries, and lemon juice into a blender. Puree until smooth, scraping down the sides as needed. Add ice and pulse again until slushy. Pour into glasses and serve immediately. Also good with a little sparkling water added. These might also be a lovely accompaniment to brunch for Father’s Day or any special occasion this summer.